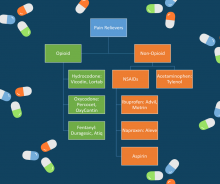 Many individuals believe that opioids are the strongest pain medications, but a recent study of chronic pain patients has showed that after 12 months of treatment, the opioid group and the non-opioid group had similar pain-related function. Additionally, the non-opioid group had a significantly lower pain intensity and had fewer harmful symptoms than the opioid group. This research emphasized that single analgesic therapies don’t work well in all chronic pain patients. We think it is important to find ways to individualize treatments. We are trying to identify which pain patient responds to which treatment to find safe and effective treatments for managing chronic pain.